I am a UKCP registered psychotherapist, and BACP registered counsellor, working with individuals and couples on a long or short term basis. I trained as a Social Worker in the early 1970s. and worked with adults in a variety of settings. Before my retirement from social work in 2011 I worked for 22 years with adults with mental health problems in Cambridgeshire. I now work solely at the Dunton Centre, which I joined in 1996. During my social work career I worked in Liverpool with families in Child Guidance Services, developing my interest in psychodynamic counselling. I moved to London in 1979 to complete a couples training at the Tavistock. I then worked for the Family Welfare Association and managed a Centre in North London. We developed a community approach offering psychodynamic counselling, a drop in, volunteer training and experience. I moved to Bedfordshire in 1991 and worked as a Mental Health Social Worker in Cambridgeshire. 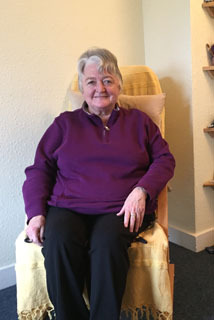 I completed a part time 4 year counselling training in 1998 and started my private practice at the Dunton Centre, working with individuals and couples, as an Associate member. My psychodynamic approach involves exploring where current and past experiences may be contributing to difficulties in your life and hampering the development of sustaining, enriching relationships, preventing freedom of thought to make decisions in important areas of life. It can be difficult to make the first step into counselling. The experience of sharing may have led to disappointment and pain in the past. You may feel anxious, depressed, overwhelmed, betrayed due to relationship problems, divorce/separation, bereavement,suffering work pressures, or facing a life change such as retirement. I aim to provide a welcoming, safe, non judgemental space to talk about difficult matters, based on a belief that insights into ourselves emerge through our relationships with others. Counselling can offer a professional relationship to achieve this self knowledge and make decisions to enhance our emotional and mental wellbeing. Initial process: I offer an initial assessment meeting to people to talk about your difficulties, any queries you have about counselling and whether it is the most helpful way forward. I will not tell you what to do, we would work together to find your own valuable and unique answers, This can be troubling and unfamiliar in the short term. In the longer term it means that any changes you make are your own, to be taken into your life and enjoyed.